George Clooney’s representative has denied reports that the actor and his lawyer wife, Amal Clooney, are planning to adopt a child from a war-torn country. The story of adoption is “100 per cent fabricated”, NDTV quoted the “Gravity” star’s rep comment to Ace Showbiz. Report of the Clooney couple’s adoption plan first originated from Woman’s Day magazine. It had stated that George and Amal want to “highlight the plight of orphans in countries like Syria,” as quoted by Daily Mail. It was also reported that Brad Pitt and Angelina Jolie, who are parents to three adopted children, inspired the newly-married duo. George is known for his humanitarian efforts. He has been working as one of the United Nations Messengers of Peace since 31 January 2008. The Oscar-winning actor has also raised funds to help the victims of the 2010 Haiti earthquake, 2004 tsunami, and the 9/11 attacks. He is also the spokesperson for resolution of the Darfur conflict. He has also become a part of the documentary “A Journey to Darfur,” which showcased the lives of refuges. He is the co-founder of “Enough Project” whose mission is to put a stop to genocide and crimes against humanity. Meanwhile, Amal is a humanitarian lawyer and has represented UNICEF at the Global Summit to End Sexual Violence in Conflict. She will also be fighting the case of Mr Mohamed Fahmy, a journalist who has been taken as a prisoner in Egypt. In defence of Fahmy, she and her colleague Mark Wassouf have said in an official statement that Fahmy’s conviction should be overruled as it is “fundamentally unfair and his imprisonment a travesty of justice,” according to E!. 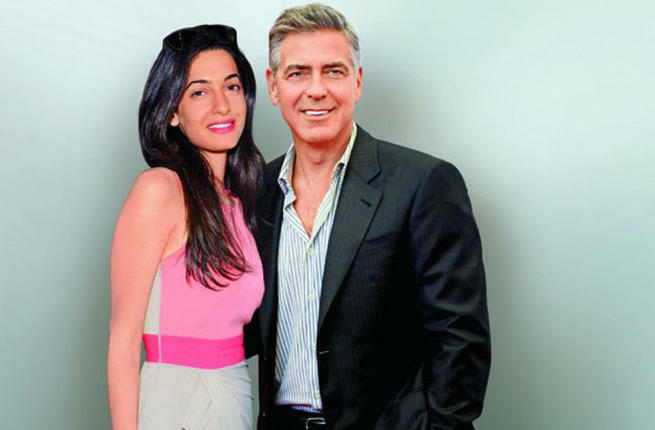 Amal and George were married in a lavish ceremony in Italy. More than 100 guests were invited for the wedding. The London-based lawyer wore an Oscar de la Renta gown for her nuptial. “George and I wanted a wedding that was romantic and elegant, and I can’t imagine anyone more able than Oscar to capture this mood in a dress,” she said about the dress as per the Website. Her dress featured 14-yards of Chantilly lace appliqués, adorned with embroidery and beading on the bodice.